Bring a splash of nature to your storefront, office, or place of business with a KNOX City Planter! Each year, KNOX and the Greater Hartford Green Team prepares 300 planters with flowering annuals and foliage centerpieces for citywide beautification. This well-known program was formerly coordinated in partnership with volunteers and the Hartford Business Improvement District. In 2019, KNOX is asking for your help as we work to keep this vital community resource available to the Hartford area. The gorgeous planters are generous in size and are overflowing with locally grown annuals and a centerpiece, providing a welcoming environment that encourages residents and visitors to spend more time outside. The result is a pedestrian friendly, walkable streetscape and a sense of community pride. Beginning in March, the Greater Hartford Green Team, along with community volunteers, plant the seeds and seedlings to be transferred into large 3-foot planters in May. 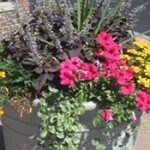 Each planter is conveniently delivered to your requested location after the first week in June. Maintenance can be done by you, or KNOX, and includes frequent, thorough watering, removal of trash, and communication with KNOX if there are problems. KNOX will replace healthy planters damaged by vehicles or vandalism. or for more information, contact Kimberly Beal, Community Engagement Manager. All 2019 KNOX City Planter Sponsors will have their logo featured throughout the year. © 2012 KNOX, Inc. All Rights Reserved. KNOX, Inc. is a 501(c)3 nonprofit organization.